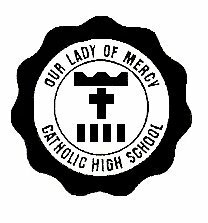 Admissions to Our Lady of Mercy Catholic High School are done on a highly competitive basis. Typically no more than 35 students are admitted to each grade level. Candidates for admission to the freshman class must be an eighth grade graduate with a diploma. Candidates must also (1) complete the OLMCHS Entrance Exam with a passing score, which will be decided based upon the overall average for each year; (2) complete the OLMCHS Application for Admission; (3) complete a personal interview of student and student’s parents or guardian; and (4) Provide official transcript and diploma from elementary school. Students will be notified that they are being considered for acceptance by way of a letter sent to their elementary school or directly to parents. The date of the OLMCH Entrance Exam varies yearly and will be announced several weeks prior to it taking place. Be admitted into the grade immediately higher than the last grade completed (all quarters must have been completed). Provide an official transcript if he or she had transferred to another institution to continue education and wants to then return to OLMCHS. The situation will be reviewed with the student and his or her parents for proper placement. Complete the OLMCHS Application for Admission. Provide official transcript from institution previously attended. request from a licensed medical practitioner the completion of the OLMCHS Medical Clearance Form. complete the OLMCHS Registration Form. provide payment in FULL of the non-refundable, yearly registration fee. Students at Our Lady of Mercy Catholic High School thrive academically. Our students have won many academic honors and scholarships including Pohnpei and FSM Law debate championships, STEP-UP program, Junior States of America (JSA) four-week Summer Program, SAKURA Science Program, and others. 99% of graduating seniors go on to attend a college or university and several attend schools in the US with scholarships. At Our Lady of Mercy Catholic High School, we teach our students the value of serving one another and our community. All of our students partake in community service projects every year, and we encourage our students to continue to give back to their communities after they graduate. For us at OLMCHS, education without service is not truly education and everything that we do is guided by that principle. Please let us know if you have any questions about the admissions process or about our school. We are always happy to hear from you.